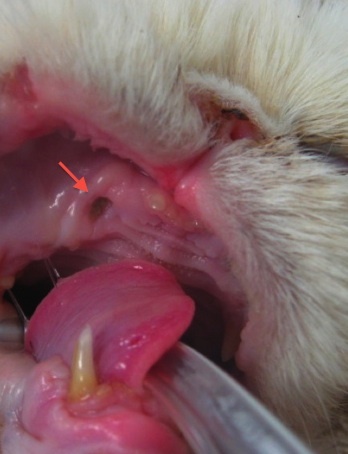 An oronasal fistula is a connection between the mouth and the nose secondary to severe periodontal bone loss and periodontal disease. Nasal discharge, sneezing, and bad breath are often the result of oronasal fistulae. Fistulae are often noted with close examination under general anesthesia. If the surrounding teeth are still present, extraction is most often indicated due to advanced disease. The connection should also be repaired with surgery.